This is one of the coolest stories of a UFO encounter where he literally finds himself flying inside the saucer itself…-A.M.
His is an old-fashioned UFO story in the same vein as George Adamski and Daniel Fry. He was not abducted by grey aliens, but communicated face-to-face with blonde-haired, blue-eyed Nordic types. It’s a pretty much “nuts-and-bolts” encounter with a couple of junkets to other planets and another dimension or two. Nothing out of the ordinary. Ever heard the name Oscar Magocsi? No? Doesn’t ring a bell? Well, enough with the “trick” comments and questions already. We would all have to agree that Oscar Magocsi is a little known and forgotten contactee whose experiences are recounted in Timothy Green Beckley’s “The Authentic Book of Ultra-Terrestrial Contacts.” Beckley heard Magocsi’s stories both by phone as well as later during an in-person meeting some years ago and considers it to be among the wilder encounter tales he has ever come across. But Beckley adds that Magocsi seemed sincere and did not strike him as the type of individual to be making all this up. The first of Magocsi’s encounters took place in 1975 on vacation property he owned in Canada, north of Toronto and near a small town called Huntsville. It was nighttime, and Magocsi was sitting outside by his campfire. He was alone, and began to have the feeling that something was watching him. The experience left Magocsi more curious than frightened. During the next few days, he asked his neighbors, casually, if they had ever seen anything strange in the area. They all replied that they had not. He also made inquiries in the Toronto area and began to attend lectures about UFOs there, having developed an intense interest in the subject. After one particular UFO lecture, Magocsi was approached by a fellow who told him he knew that Magocsi had something to do with UFOs, that he could see an orange aura around Magocsi that was an unmistakable sign that he was linked or connected to the phenomenon. The stranger told Magocsi that as he looked up at the UFO, his car stalled just in front of a bridge spanning a valley. Within a few seconds of the car stalling, the bridge collapsed in the aftermath of the earthquake. A few days later, Magocsi decided he wanted to see a movie. On the way to the theater, as he was proceeding down one of the main streets, he stopped to look at a poster on a wall advertising a psychic fair being held at the Sheraton Hotel. He considered the possibility of attending the psychic fair, but decided to stick to his plan for a trip to the movies. Since he was already there, Magocsi decided to check out the psychic fair. A tall, blonde stranger seemed to pick him out of the crowd and approached Magocsi. They conversed about Magocsi’s sighting the previous summer and the UFO subject in general. Magocsi allowed as how he would like to have a more direct experience with the UFO occupants, something beyond just seeing one of their ships. The blonde stranger advised Magocsi to return to his vacation property the next summer when the time would be right for the kind of encounter Magocsi wanted. Whether he believed the stranger or not, Magocsi did return to his vacation property that next July. 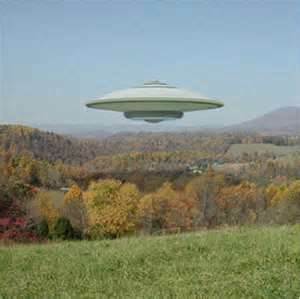 The first couple of nights, nothing happened, but on the third night, the UFO showed up, landing behind the nearby hill. Magocsi took his flashlight and took off on foot. He found the ship in a forest clearing, hovering about 60 feet off the ground. He stopped about 50 feet from the object, which then slowly came down and landed noiselessly. He approached the craft and saw three portholes with a yellow light emanating from them, but he couldn’t see inside because they were higher than his eye level. The ship returned a couple of nights later, but Magocsi stayed home, still fearful of the sudden burst of light he had experienced. But the next night, his courage returned, and he felt his earlier fright and flight had been stupid. He promised himself that the next time he was inside the craft, he would stay. When the ship landed that night, he went onboard again. His wish was soon granted. The ship began to ascend to an altitude of about 1,000 feet and he could see through the portholes that the whole landscape beneath him was almost fully lit in spite of the fact that it was pitch black nighttime. The ship first took him to Toronto, 120 miles away, in about two to three minutes. Ten minutes later they were flying over New York City. Magocsi felt a mental urge to see the pyramids next, though he cannot say whether the thought was his own or implanted by the aliens. He dozed off, and when he awakened the ship was directly over the great pyramids in Egypt. There was a perfect alignment at that moment with the sun and the apex of the Great Pyramid, and some form of energy from the pyramids seemed to be sucked up as though through a vacuum cleaner into the ship. Magocsi next journeyed to another Middle Eastern country which he thought might be Syria or somewhere like it. After waiting there for a while, Magocsi stepped outside the ship and saw what he thought was an approaching dust storm. Seeking to escape the furnace-like heat of the desert, Magocsi went back inside the ship and the ship lifted itself up and out of the fray. When they had reached an altitude of about 10,000 feet, three jetfighters appeared that Magocis believes were Arabian, but he can’t be sure because they flew by too quickly for him to read their insignia. The lead plane fired two missiles at the ship, which the saucer dodged by lifting up so suddenly that Magocsi felt his stomach was still back there in the desert. The saucer fired something like a “laser cannon” at the missiles and they exploded harmlessly a half mile away. Whether or not that is the case, the desert incident does sound similar to other encounters between a UFO and an earthly military agency, whether Arab or Russian or American. The scrambling of jets and the useless attempts to fire on the unidentified craft are familiar from many previous accounts that have entered the lore of UFOlogy and never been completely disproved. Even if the aliens were in fact “showing off” for Magocsi, the typical military engagement scenario has definitely repeated itself here. The ship flew Magocsi on to the Himalayas of Tibet, where they landed high in the mountains, near the peaks. He and the ship sat there in idleness for a long while. Then he saw a line of people approaching, carrying torches. One of the monks approached the saucer and opened the door, which he somehow knew how to do. He threw a pair of “funny boots” at Magocsi and motioned for him to put them on. The monk and his fellows then escorted Magocsi from the saucer into the mountains through underground caves and into an underground monastery. The faces of the monks were not only Asian; there were also white, black and red Indian faces, and it seemed like every race in the world was represented. Part II continues March 18, 2013!